'Young Monsters in Love' #1: The Horror News Network Review - Horror News Network - The Horror News You Need! 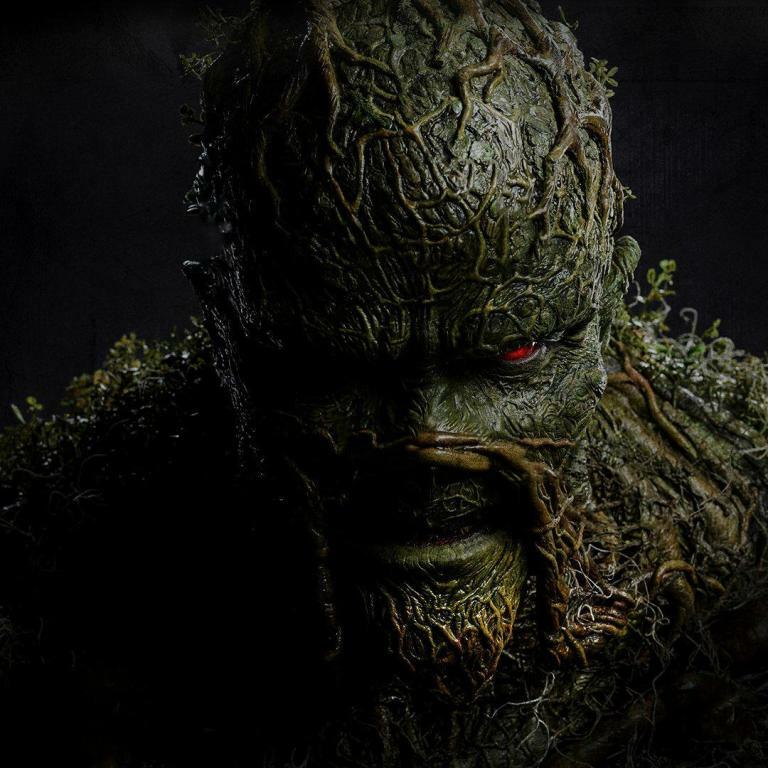 This week was a special one for DC monster fans, as the company not only released the stellar Swamp Thing Winter Special #1 (by Tom King and Jason Fabok), but they also dug through their vaults and unearthed a host of their monsters from every era for a Valentine’s Day anthology special entitled Young Monsters in Love #1. 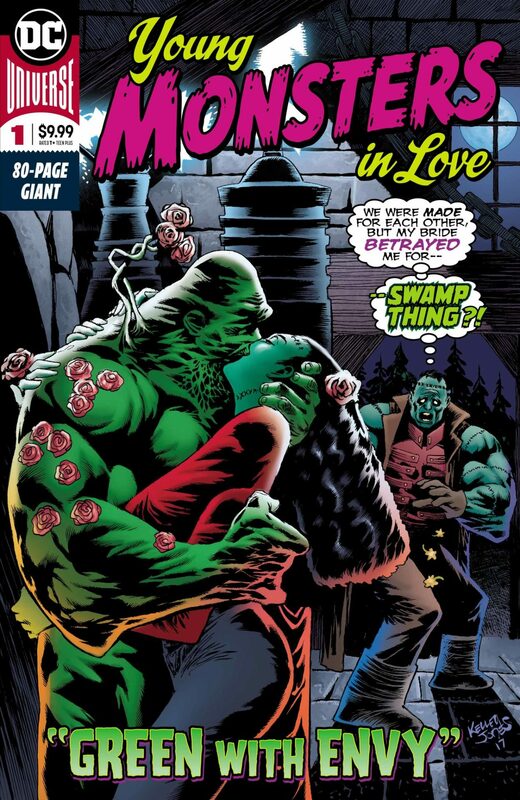 Borrowing the title from yesteryear’s romance comics of the 1950’s, Young Monsters in Love #1 is a lengthy anthology featuring both obscure and popular monster characters from DC’s long publishing history. With 80 pages to work with, the collection is able to highlight a number of characters that we rarely see such as I Vampire, the Monster Commandos, and Monsieur Mallah and the Brain, while also giving some fan favorites like Man-Bat, Solomon Grundy, and Swamp Thing a short story or two. While fans will certainly get the monster fix they are looking for from this anthology, the ten short stories are of varying quality, particularly when it comes to the writing and art featured in each vignette. Many of the selections feature stand-out artwork with lackluster writing, while on the other hand, others feature solid scripting with artwork that doesn’t excite the reader. A few that find the perfect balance however are Kyle Higgins and Kelley Jones Man-Bat adventure “Nocturnal Enemy”, Paul Dini and Guillem March’s Deadman story “Be My Valentine”, and Mark Russell and Frazer Irving’s “Heart Shaped Box” featuring the Swamp Thing. For many fans who started reading comics in the 1990’s, Kelley Jones is the artist that they most associate with Batman. And as fans of Jones’ unique art style know, he is never better than when he is drawing Batman’s monster villains, chief among them Man-Bat. This Doctor Jekyll-Mr. Hyde tale by Higgins may at first seem out of place in an anthology centered around romance, but it quickly becomes clear that the beast looking to burst forth from Dr. Kirk Langstrom’s id is very fond of the scientist. As you can imagine, Kirk is not a man that does well meeting new people, especially when an enormous bat creature is whispering “sweet nothings” in his ear. If this story was just an excuse for Jones to draw the Man-Bat again, most fans would be satisfied, but Jones’ art along with an inside look at his relationship with his other self starts the anthology off with a bang (Jones also provides the “heart-wrenching” cover of this collection which features a distraught Frankenstein catching his bride and the Swamp Thing in a monstrous lip-lock). Another character that loyal fans refuse to let die in peace is Arnold Drake and Carmine Infantino’s Deadman. The character has had a spotty publication history, but it seems like every era or incarnation of DC’s “universe of the moment” gets their version of the circus trapeze artist turned dead superhero. While most associate Neal Adams with the character’s most prominent and popular issues from the 1970’s, Sarah Vaughan and Lan Medina recently tried to resurrect the character for a modern audience in the three issue mini-series Deadman: Dark Mansion of Forbidden Love. The series (which was released in 2016) was well received by fans and critics alike and Adams returned to the character recently with the six issue mini-series “Journey into Death” (which began last November). Dini follows in Vaughan’s footsteps more so than Adams, as the Deadman in “Be My Valentine” is of a more sympathetic, caring variety than past versions of Boston Brand. Dini is well-known for crafting stories with “heart” and this tale of an elementary school Valentine exchange gone wrong is both poignant and hilarious, as the ghost assists a young man with a healthy dose of self-esteem and some much needed revenge against some school-yard bullies. 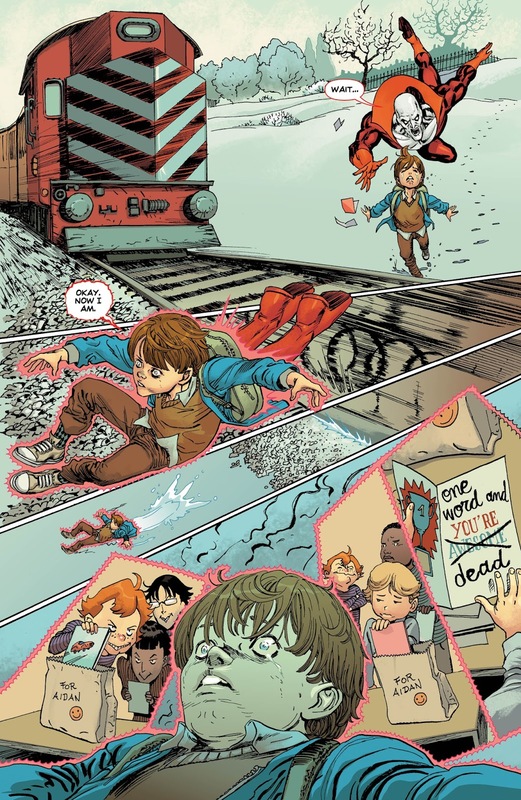 Guillen March’s artwork wavers between the epic and cartoonish, striking the right mix for a story that features “real-life’ struggles with human nature as well as floating little boys. Perhaps the stand-out in this anthology is DC’s perennial monster champ, in the form of the Swamp Thing’s story “Heart Shaped Box” by Mark Russel and Frazier Irving. Irving is one of the most unique artists working in the medium today and his style, like Jones, is best served when illustrating the stranger corners of the DC Universe. His work on Grant Morrison’s Klarion the Witch Boy introduced the British artist to a whole new audience in 2005 and he has continued to produce work state-side ever since. His colorful, muted style works perfectly in this odd love story between the Swamp Thing and a botanist (talk about love at first sight!) in the back wood swamps of Louisiana. Russel and Irving perfectly compliment each other, providing an awkward, tale about love and loss, which will hopefully lead to more stories from this pair featuring DC’s most famous tragic monster. Overall, this collection is sure to appeal to your DC monster sweet tooth, even if some of the Valentine’s candy featured within these pages is more satisfying than others.